The weather is supposed to be fine and clear tomorrow, and I need to get out and ride. The winter seems interminable and it's grey and damp here now. I've been busy indoors these past few days, and my conscience is clear – chores complete, jobs done – even the ironing! So I can ride out tomorrow nice and happy. My fitness has suffered over the past few months – like everybody's I suppose, so there won't be any centuries coming from me for a few weeks yet! I fancy a 50. 30 miles round here is hard work, but doable even now with my level of fitness, and it only takes a little over two hours, so I want to go further. Is my confidence up to it? Funny, but I lose confidence as I lose fitness, it happens every year. No doubt other people are the same. So where do I go? I obviously want a circular route, and I still have this strange obsession of cycling on all the roads in Cornwall, so it must be to find a new road I haven't been on yet. Nearby, that's impossible, I've done them all, so it must be further away. To this aim, I've produced this on BikeRouteToaster. It's not quite circular(!) but it will get me onto new roads. For instance, I've not cycled Bodmin/Pensilva before or even to the south of Bodmin Lanhyrock/Waterlake/West Taphouse, so it should be a good exploratory ride of just a tad over 50 miles. I should come back tired and smiley. Posted by Mick F on February 11th, 2011. It sounds like the start of a new year of riding, and now there's some good motivation to spur you on. May the wind be at your back! I live quite close to the Taphouses, near St Cleer. If you're coming this way for a ride, I hope you enjoy hills. I think when they landscaped this bit of Cornwall they didn't iron the creases out of the plan first! Good luck, and may you be wind and rain free. I know St Cleer, I've been though it many times in the past and cycled through the village too. It doesn't hold any mysteries to me. Hills? Love 'em or hate 'em, we've got them in Cornwall! The first hill I have to conquer is Sand Hill out of Gunnislake. "Monster" is a better name, but most people refer to it as just Gunny Hill. Then it's over the top to Callington, and down over the River Lynher and up to St Ive and all the way through to Liskeard and Dobwalls. Down the A390 to West Taphouse, and then it's a new road for me to Lanhydrock. Cross the A38 and down past Bodmin Crematorium, then new roads for me again through St Neot when it's back to cycling familiarity again. Rather than come back along the A390 as I had on BRT, I may turn off at Pensilva and go through Golberdon and Kelly Bray to get home. I reckon on 4 or possibly 5 hours. Where to tomorrow? Same as today, yesterday, and the day before. The day after tomorrow too. I do the same ride every day, including Christmas Day – a hilly loop of about 25 miles that takes around two hours. If I'm short of time I might cut it to 20 miles, or up it to 30 when I'm in the mood. Unless the weather is bad or I'm on a planned trip somewhere else, I ride from Horwich to Rivington, White Coppice, Heapey, Wheelton, out towards Brindle, then come back through Chorley, Limbrick, Rivington, and home. I sometimes vary it a little but it's essentially the same. Nice! Have a good ride Mick. Excellent weather for Saturday. Yes, good luck with your ride, Mick. That's a good solid distance after such a long lay off. I haven't checked your weather forecast, but Saturday up here is supposed to be better than Sunday. No cycling for me this weekend. I've got a longish walk on the North York Moors tomorrow to work some other leg muscles. Patrick, that must be some ride if you're able to keep motivated to do pretty much the same route day after day. You'll need to add in some more loops with the Skipton ride to come this summer. Ooh, got some new wheels today. Chickened out of building them myself, but they're not much more expensive than the price I could have got the parts for online. Shimano 105 Black hubs with Mavic Open Pro rims (also black) and Sapim double-butted stainless steel spokes. 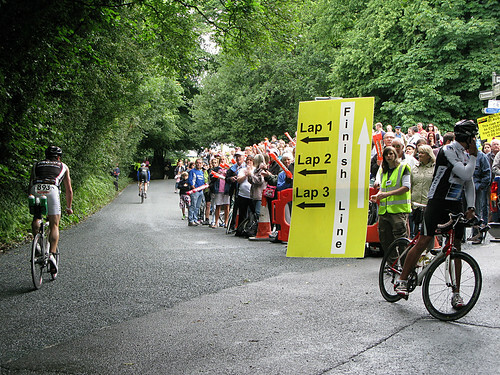 Chris wrote: You'll need to add in some more loops with the Skipton ride to come this summer. Well, with this regime I was fine on the Rivington 100 last summer. The only issue was sore feet. I probably cycle about 7,000 miles per year, with few layoffs. It's the layoffs that do the damage. Good news about the wheels but don't leave me behind! Patrick wrote: It's the layoffs that do the damage. Yes, I need consistency and momentum. Hope you managed a good run out Mick. Dunno about weather down south. Today it was perfect – no wind, Mr Sunshine all day (a bit of fog down south though). Like Kern said, it does sound like a new season riding is starting... OH, Spring, please be not far away... today was spring like, lambs in fields and daffodils poking though, there was even a tiny weeny bit of warmth in the sun too. 51.25 miles of the most hilly ride I've probably ever done. The first half, on the way down the A390 and up to Bodmin via the back roads was a trifle windy. Although the ride to Bodmin was ok, the stiff westerly made for hard work. Even so, I didn't stop – other than for junctions – until I made it to the A38 roundabout – 25 miles. I'd taken some snack bars and a Penguin biscuit and made sure I was stocked up with a good breakfast before I left. When I stopped, I ate a snack bar, and washed it down with a good slosh of water. The weather forecast was good, but there were showers possible, and it was misty in the valley as I left though the sun came out up the hill. At Bodmin I saw a huge rainbow to the north. Beautiful! I'd brought my Goretex Paclite in my saddlebag, so was unconcerned about the possibility of showers. The sky grew darker, but I stayed dry. Later, the sun came out again, and it really did feel like spring. From the A38 roundabout I headed back to the east with a nice tailwind. This is where the hills start, so off I went feeling good but with some trepidation. Hills came and went, and one or two were pigs! The hill to the east of St Neot being one. Later, another hill came – a real pig! Perhaps 1in4 and I was tiring. The road was narrow and mud strewn and after about 100yds, I had to stop to get my breath. I leant against the right hand bank. This hill was narrow – very narrow – only 6 or 7 feet with high rocky banks either side. As I'm recovering and steeling myself for the rest of the hill, I heard a vehicle coming up. It was huge Transit van and I looked at the width of it and the available space. No way could it get past, so I shrugged my shoulders and plodded on, only to see a car coming down the hill! I managed to get past it – just – and I smiled to myself that the van or the car would have to reverse! I plodded on and left them to sort it out! Such fun! At the top of the hill the road widened and the van made it past me at last. I waved cheerily as he passed. The rest of the ride was uneventful. I stopped a few times and when I was about an hour away from home, I phoned Hilary with an ETA. I hurtled down Gunnislake hill at 40mph+ and turned into the lane. The Rising Sun was just about to close – it was shortly after 3pm – but the landlord allowed me a quick beer. I needed it! Home soon after, and I was whacked! Very whacked indeed, but happy and whacked. A good ride, a a couple of "new roads" to record on my map of Cornwall. No wonder I was whacked! Brilliant Mick, nothing better than a good run out. Especially when all the parts that ensure a good ride all come together. Weather (of course), scenery, your own emotional feelings and motivation and of course the hills! When I'm not in a rush, I enjoy traffic-watching. Yesterday it was a lad in hi-viz on a bike being the front-man for a girl in hi-viz on a horse, followed by a car. I didn't want to spook the horse or car, so pulled in until they had all gone past. It might have cost me doing my Quick Spin in 30 minutes, but it was fun watching them. I can back up Mick's hilliness of Cornwall comment. I've cycled in Cornwall four times. It's a killer. So is Devon. We've nothing as hilly in Ireland. The closest would be Co.Donegal. It's not to say that we don't have severe hills near here because we do, but they are avoidable. Worst hill near Cork is Temple Hill, about 3.5 miles from my house. Average gradient 15%, almost half a mile in length. In Cork City we have the famous Patrick's Hill which Greg Lemond said was the worst he'd ever climbed. About 100 yards of 15% followed by 50yd of 25%. I've seen worse in England. There's a hill somewhere to the West of Widecome (?) bay which is marked at 35% as far as I recall. I couldn't cycle it fully loaded, nor could I without the load either, I imagine. Chris wrote: Patrick, that must be some ride if you're able to keep motivated to do pretty much the same route day after day. Here's the route Chris: on Google Maps. A route or a rut? I'll join Audax I think. Sad to see that Rivington Green is deserted. I remember the post office and shop and people sitting on the green eating ice cream and a having picnic. I'm not going that far back in time – late 60's early 70's. Another part of my past that is gone! Don't be sad, Mick. Google's photo-van caught Rivington on an off-day. It is alive and well. In nice weather it's full of people on the green. The Post Office is gone (although a sign over the door reads: "The Old Post Office") and so is the phone box, but just around the corner is a very nice tea room, another cafe is down the road and a village church with quaint country weddings. Don't know if you remember the Rivington Barns but they are thriving too. The Lower Barn is a popular eating place for cyclists and the Upper Barn car park on a Sunday is brimming with motorcyclists – on a cold winter day you warm yourself up walking amongst the engines. Well over a hundred bikes. At weekends Sandra refuses to cycle through Rivington, it's so busy. Plus, there's a village school (very popular), an arboretum, an art gallery, Go-Ape, dozens of fishermen fishing the reservoir, people walking up Rivington Pike, Lord Leverhulme's Chinese Gardens, and bicycle road races as well as the IronMan and the Rivington 100 bicycle ride challenge... the stocks are still there on the green. When I ride out with the local CTC we often stop at the Rivington chapel tearooms on our way back to Bury. None of us have ever "named that tune" that the chap on the piano plays. We live in hope. But how many tea rooms do you visit where you are serenaded with live music whilst you butter your scone?